Scientists from NASA's Dawn mission unveiled new images from the spacecraft's lowest orbit at Ceres, including highly-anticipated views of Occator Crater, at the 47th annual Lunar and Planetary Science Conference in The Woodlands, Texas, on Tuesday. "Before Dawn began its intensive observations of Ceres last year, Occator Crater looked to be one large bright area. Now, with the latest close views, we can see complex features that provide new mysteries to investigate," said Ralf Jaumann, planetary scientist and Dawn co-investigator at the German Aerospace Center (DLR) in Berlin. "The intricate geometry of the crater interior suggests geologic activity in the recent past, but we will need to complete detailed geologic mapping of the crater in order to test hypotheses for its formation." 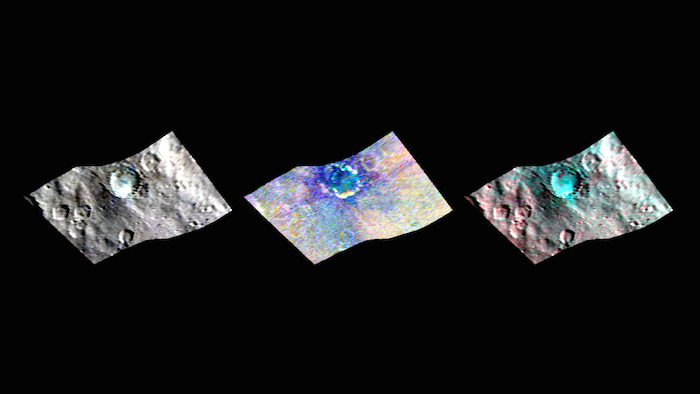 Ceres' Haulani Crater (21 miles, 34 kilometers wide) is shown in these views from the visible and infrared mapping spectrometer (VIR) aboard NASA's Dawn spacecraft. "Although impact processes dominate the surface geology on Ceres, we have identified specific color variations on the surface indicating material alterations that are due to a complex interaction of the impact process and the subsurface composition," Jaumann said. "Additionally, this gives evidence for a subsurface layer enriched in ice and volatiles." This map shows a portion of the northern hemisphere of Ceres with neutron counting data acquired by the gamma ray and neutron detector (GRaND) instrument aboard NASA's Dawn spacecraft. Data relevant to the possibility of subsurface ice is also emerging from Dawn's Gamma Ray and Neutron Detector (GRaND), which began acquiring its primary data set in December. Neutrons and gamma rays produced by cosmic ray interactions with surface materials provide a fingerprint of Ceres’ chemical makeup. The measurements are sensitive to elemental composition of the topmost yard (meter) of the regolith. In Dawn's lowest-altitude orbit, the instrument has detected fewer neutrons near the poles of Ceres than at the equator, which indicates increased hydrogen concentration at high latitudes. As hydrogen is a principal constituent of water, water ice could be present close to the surface in polar regions. "Our analyses will test a longstanding prediction that water ice can survive just beneath Ceres' cold, high-latitude surface for billions of years," said Tom Prettyman, the lead for GRaND and Dawn co-investigator at the Planetary Science Institute, Tucson, Arizona. 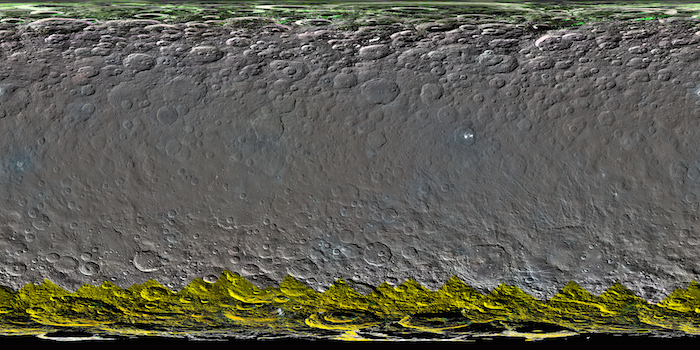 This colorized global map of Ceres was created from a clear-filter mosaic. "False-color images of Haulani show that material excavated by an impact is different than the general surface composition of Ceres. The diversity of materials implies either that there is a mixed layer underneath, or that the impact itself changed the properties of the materials," said Maria Cristina de Sanctis, the VIR instrument lead scientist, based at the National Institute of Astrophysics, Rome. Dawn made history last year as the first mission to reach a dwarf planet, and the first to orbit two distinct extraterrestrial targets -- both of them in the main asteroid belt between Mars and Jupiter. The mission conducted extensive observations of Vesta during its 14-month orbit there in 2011-2012. "We're excited to unveil these beautiful new images, especially Occator, which illustrate the complexity of the processes shaping Ceres' surface. Now that we can see Ceres’ enigmatic bright spots, surface minerals and morphology in high resolution, we're busy working to figure out what processes shaped this unique dwarf planet. By comparing Ceres with Vesta, we'll glean new insights about the early solar system," said Carol Raymond, deputy principal investigator for the Dawn mission, based at NASA's Jet Propulsion Laboratory, Pasadena, California.Dawn's mission is managed by JPL for NASA's Science Mission Directorate in Washington. Dawn is a project of the directorate's Discovery Program, managed by NASA's Marshall Space Flight Center in Huntsville, Alabama. UCLA is responsible for overall Dawn mission science. Orbital ATK Inc., in Dulles, Virginia, designed and built the spacecraft. The German Aerospace Center, Max Planck Institute for Solar System Research, Italian Space Agency and Italian National Astrophysical Institute are international partners on the mission team. The bright spots of Occator Crater are shown in enhanced color in this view from NASA's Dawn spacecraft. 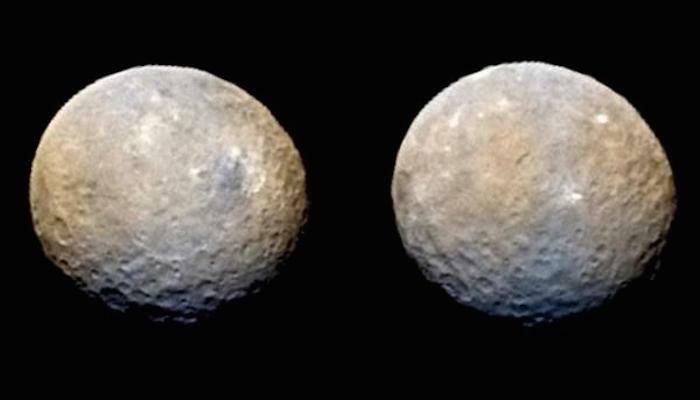 Such views can be used to highlight subtle color differences on Ceres' surface. 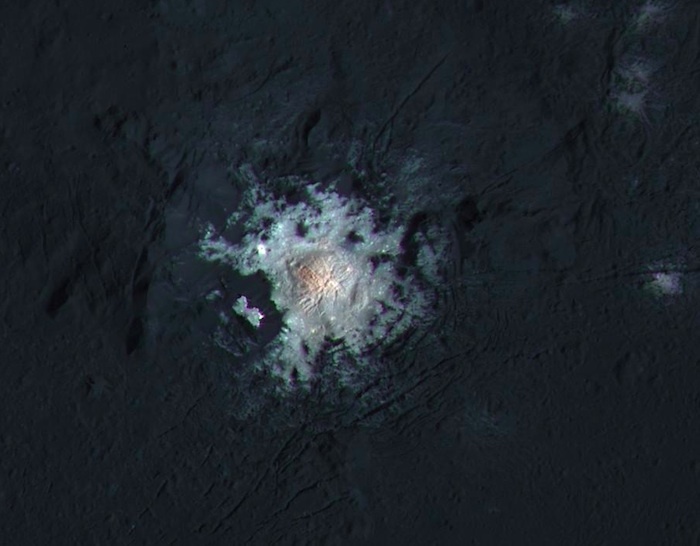 This is the largest bright spot on Ceres, located at the center of Occator Crater. 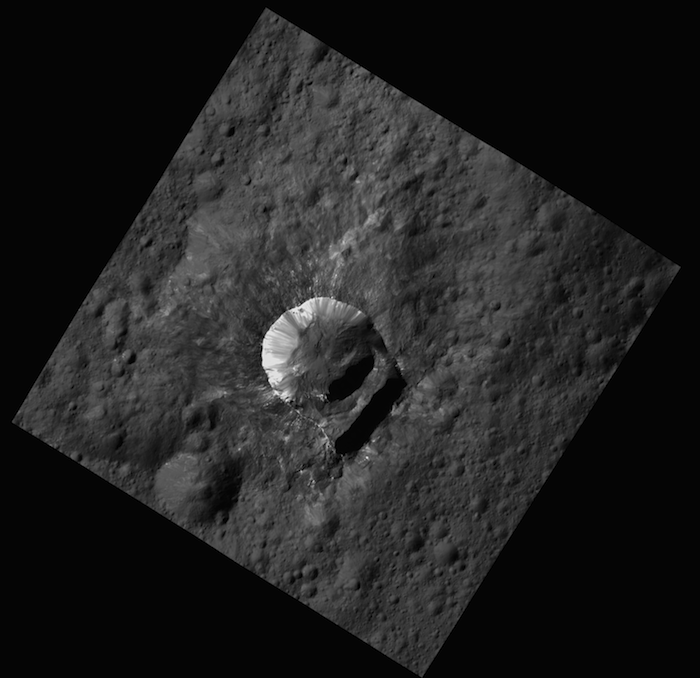 Dawn took the picture at point-blank range, just 240 miles (385 kilometers) above the crater's floor. By far the best photo ever taken of a bright spot on Ceres, it reveals a dome criss-crossed by numerous linear features and fractures. It does not, however, solve the mystery. "The intricate geometry of the crater interior suggests geologic activity in the recent past, but we will need to complete detailed geologic mapping of the crater in order to test multiple hypotheses for its formation," says Ralf Jaumann of the German Aerospace Center. He is a member of the Dawn science team that released the new images at the 47th annual Lunar and Planetary Science Conference in The Woodlands, Texas, on March 22nd. Ceres' Haulani Crater, with a diameter of 21 miles (34 kilometers), shows evidence of landslides from its crater rim. Haulani Crater, with a diameter of 21 miles (34 kilometers), shows evidence of landslides from its crater rim. Smooth material and a central ridge stand out on its floor. An enhanced false-color view allows scientists to gain insight into materials and how they relate to surface morphology. This image shows rays of bluish ejected material. 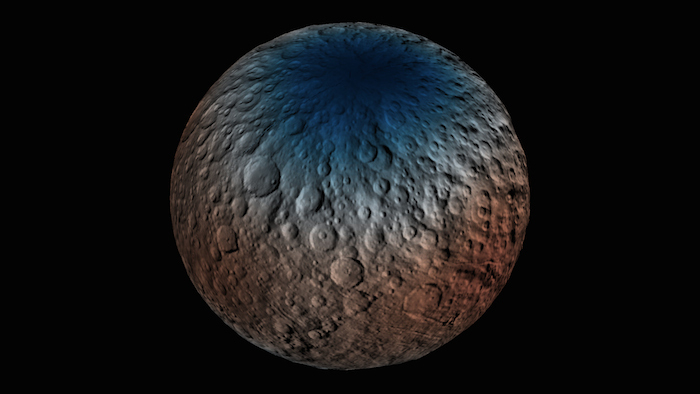 The color blue in such views has been associated with young features on Ceres. "Haulani perfectly displays the properties we would expect from a fresh impact into the surface of Ceres. The crater floor is largely free of impacts, and it contrasts sharply in color from older parts of the surface," said Martin Hoffmann, co-investigator on the Dawn framing camera team, based at the Max Planck Institute for Solar System Research, Göttingen, Germany. A hidden treasure on Ceres is the 6-mile-wide (10-kilometer-wide) Oxo Crater, which is the second-brightest feature on Ceres (only Occator's central area is brighter). Oxo lies near the 0 degree meridian that defines the edge of many Ceres maps, making this small feature easy to overlook. Oxo is also unique because of the relatively large "slump" in its crater rim, where a mass of material has dropped below the surface. Dawn science team members are also examining the signatures of minerals on the crater floor, which appear different than elsewhere on Ceres. 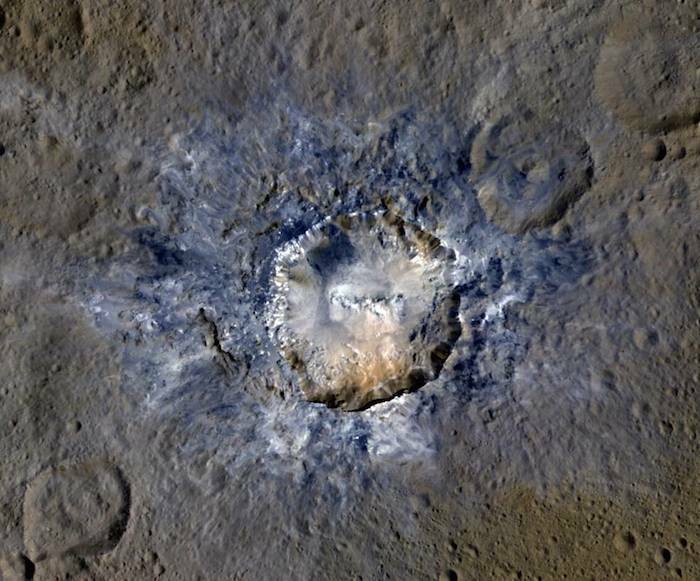 "Little Oxo may be poised to make a big contribution to understanding the upper crust of Ceres," said Chris Russell, principal investigator of the mission, based at the University of California, Los Angeles. NASA's Dawn spacecraft took images of Haulani Crater at a distance of 240 miles (385 kilometers) from the surface of Ceres. Oxo Crater is unique because of the relatively large "slump" in its crater rim. 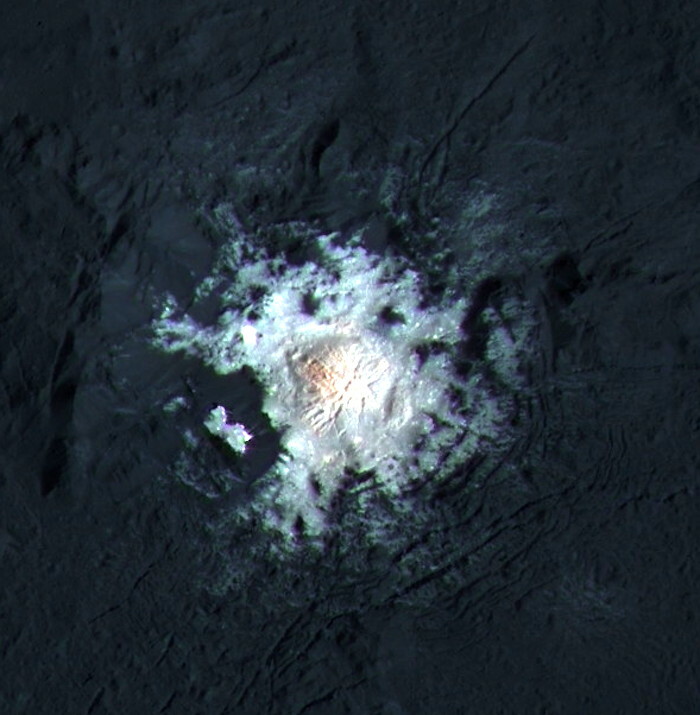 The center of Ceres' mysterious Occator Crater is the brightest area on the dwarf planet. The inset perspective view shows new data on this feature: Red signifies a high abundance of carbonates, while gray indicates a low carbonate abundance. 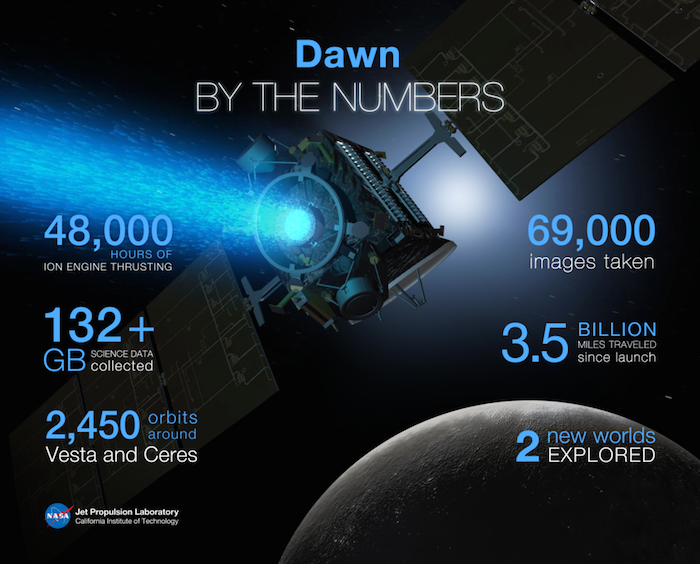 NASA's Dawn mission exceeded all expectations during its primary mission to Vesta and Ceres. Scientists with NASA's Dawn mission have identified permanently shadowed regions on the dwarf planet Ceres. Most of these areas likely have been cold enough to trap water ice for a billion years, suggesting that ice deposits could exist there now. 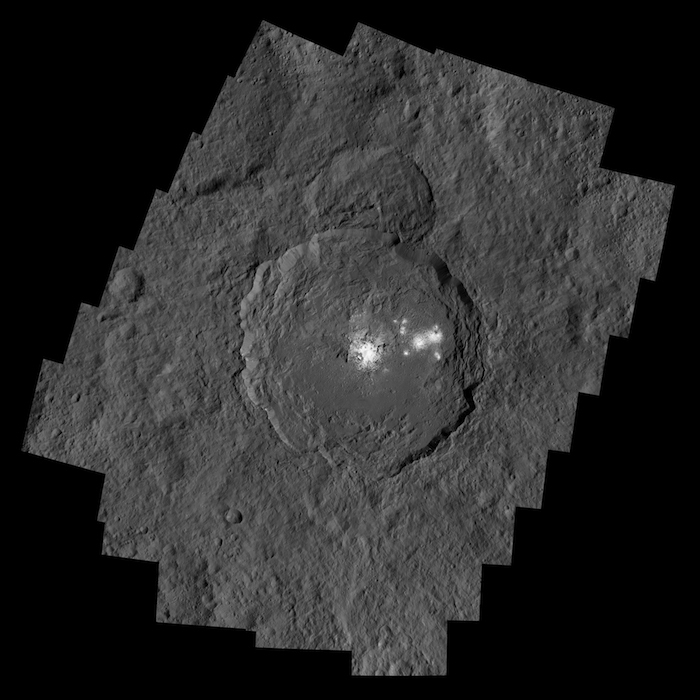 "The conditions on Ceres are right for accumulating deposits of water ice," said Norbert Schorghofer, a Dawn guest investigator at the University of Hawaii at Manoa. "Ceres has just enough mass to hold on to water molecules, and the permanently shadowed regions we identified are extremely cold -- colder than most that exist on the moon or Mercury." Permanently shadowed regions capable of accumulating surface ice were identified in the northern hemisphere of Ceres using images taken by NASA’s Dawn mission combined with sophisticated computer modeling of illumination. This artist's concept shows a diagram of how the inside of Ceres could be structured, based on data about the dwarf planet's gravity field from NASA's Dawn mission. Since gravity dominates Dawn's orbit at Ceres, scientists can measure variations in Ceres’ gravity by tracking subtle changes in the motion of the spacecraft. Using data from Dawn, scientists have mapped the variations in Ceres' gravity for the first time in a new study in the journal Nature, which provides clues to the dwarf planet's internal structure. "The new data suggest that Ceres has a weak interior, and that water and other light materials partially separated from rock during a heating phase early in its history," said Ryan Park, the study’s lead author and the supervisor of the solar system dynamics group at NASA’s Jet Propulsion Laboratory, Pasadena, California. Ceres' gravity field is measured by monitoring radio signals sent to Dawn, and then received back on Earth, by NASA’s Deep Space Network. This network is a collection of large antennas at three locations around the globe that communicate with interplanetary spacecraft. Using these signals, scientists can measure the spacecraft's speed to a precision of 0.004 inches (0.1 millimeters) per second, and then calculate the details of the gravity field. Ceres has a special property called "hydrostatic equilibrium," which was confirmed in this study. 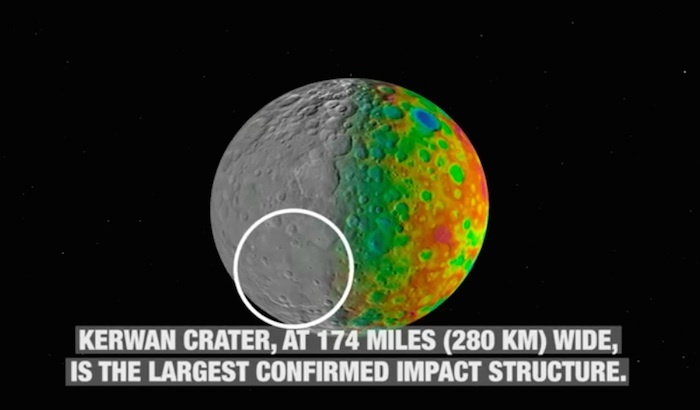 This means that Ceres' interior is weak enough that its shape is governed by how it rotates. Scientists reached this conclusion by comparing Ceres' gravity field to its shape. Ceres' hydrostatic equilibrium is one reason why astronomers classified the body as a dwarf planet in 2006. "We have found that the divisions between different layers are less pronounced inside Ceres than the moon and other planets in our solar system," Park said. “Earth, with its metallic core, semi-fluid mantle and outer crust, has a more clearly defined structure than Ceres," Park said. Scientists also found that high-elevation areas on Ceres displace mass in the interior. This is analogous to how a boat floats on water: the amount of displaced water depends on the mass of the boat. Similarly, scientists conclude that Ceres’ weak mantle can be pushed aside by the mass of mountains and other high topography in the outermost layer as though the high-elevation areas "float" on the material below. This phenomenon has been observed on other planets, including Earth, but this study is the first to confirm it at Ceres. The internal density structure, based on the new gravity data, teaches scientists about what internal processes could have occurred during the early history of Ceres. By combining this new information with previous data from Dawn about Ceres' surface composition, they can reconstruct that history: Water must have been mobile in the ancient subsurface, but the interior did not heat up to the temperatures at which silicates melt and a metallic core forms. 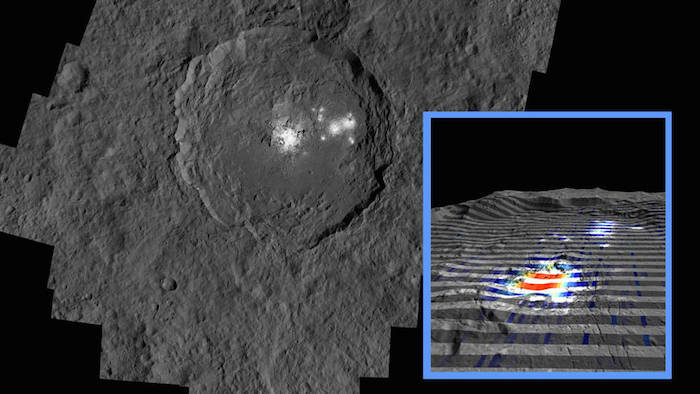 "We know from previous Dawn studies that there must have been interactions between water and rock inside Ceres," said Carol Raymond, a co-author and Dawn’s deputy principal investigator based at JPL. "That, combined with the new density structure, tells us that Ceres experienced a complex thermal history." 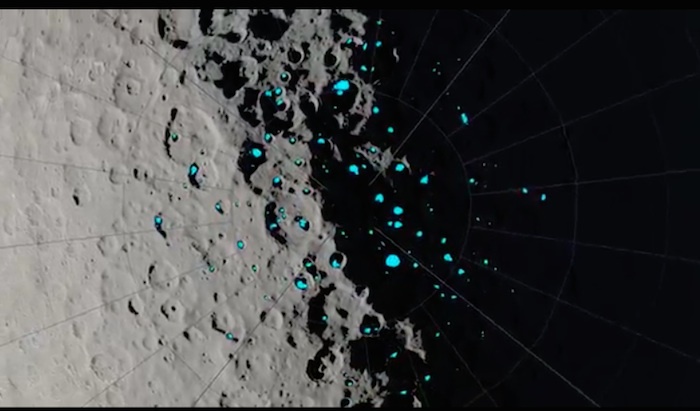 NASA scientists take stock of the treasure trove of data on the largest object in the asteroid belt. Angus Bezzina reports. An artist's impression of Dawn firing above dwarf planet Ceres. NASA’s Dawn spacecraft has beamed back an abundance of information about dwarf planet Ceres, painting a new picture of the gigantic, pockmarked asteroid made of ice and rock – and sporting an ice volcano. The papers were published in Science today. Discovered in 1801, Ceres is the largest object in the asteroid belt that whirls around the sun between Mars and Jupiter. It is thought to be a protoplanet – a mass that was on its way to becoming a planet before the gravitational pull of Jupiter stopped it from accumulating enough mass – and one of the oldest pieces of the solar system, forming within the celestial array’s first five to 15 million years. Planetary scientists think Ceres contains a layer of water-ice below its dusty outer crust – similar to Jupiter’s moon Europa and Saturn’s moon Enceladus, which are both considered to be potential sources for harbouring life. Information about the dwarf planet has come from a combination of sources including microwave studies, and analyses of meteorites thought to have originated from another, similar dwarf planet, Vesta. But the lion’s share comes from the Dawn spacecraft, launched by NASA in 2007 to get a better understanding of Ceres, Vesta and the origins of the solar system. Now, a deluge of recent Dawn data has been presented in six papers. 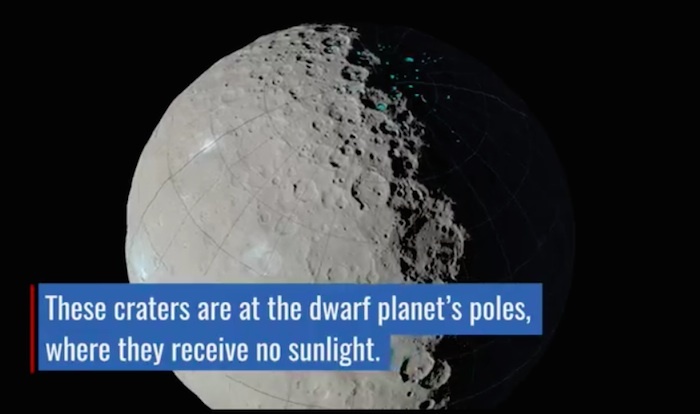 While we’ve known for a while that the dwarf planet contains water – we’ve seen water vapour emissions from the surface – exactly what the nature of the water was has been vague. 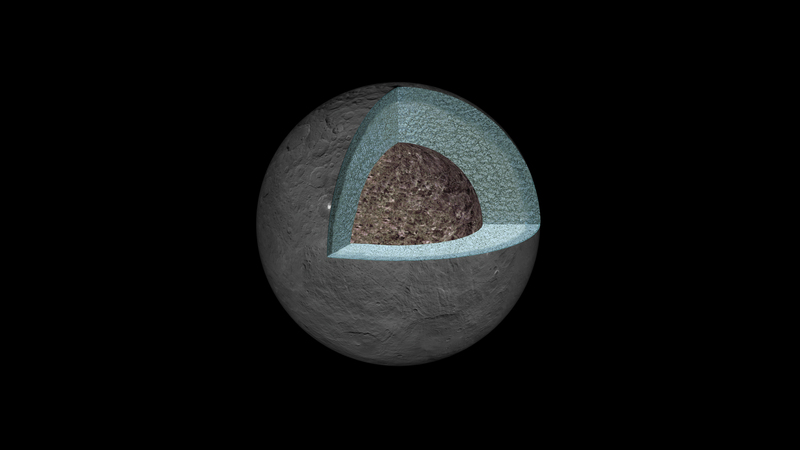 Theories have long suggested Ceres has a mantle rich in ice – and they’re right. Jean-Philippe Combe from the Bear Fight Institute in the US and his colleagues describe ice on the surface of the dwarf planet. The Dawn spacecraft found the mass of ice as it scanned the 10-kilometre-wide, geologically fresh Oxo crater with is visible light and infrared mapping spectrometer. More water-based revelations on Ceres from the spectrometer were provided by Eleonora Ammannito from the National Institute of Astrophysics in Italy and her colleagues. But rather than water ice, they uncovered a number of phyllosilicate (hydrated, rock-forming) minerals in Ceres’ clay-like crust. They found magnesium and ammonium bearing minerals all over Ceres’ surface but their abundance varied considerably from place to place. A view of the Ahuna Mons region, derived from a digital terrain model and images from the framing camera on board the Dawn spacecraft. Ceres’ distinctive outer shell is the product of a combination of ice and rock and shaped by external impacts, cryomagmatism and cryovolcanism. And it looks as though it has the solar system’s first confirmed ice volcano. Ahuna Mons is largest mountain on Ceres – but Ottaviano Ruesch from NASA’s Goddard Space Flight Centre in the US and his colleagues believe it is an ice volcano (also called a cryovolcano). Perspective view of Ahuna Mons in false colour derived from the Dawn framing camera data. The bluish hue of the mountain's flanks probably reflects a compositional change. Their claim is based on extensive modelling of the formation’s topographic profile. If correct, it would mark the first evidence of a cryovolcano, although scientists have predicted their existence before as they observed molten ices. Ruesch and his colleagues claim that features such as Ahuna Mons’ elliptical base and concave top are especially indicative of cryovolcanism because it consists of a brittle outer shell with pressurised, fluid-like material inside. They also determined that Ahuna Mons is younger than surrounding craters, suggesting that the dome-shaped mountain is a relatively recent formation, extruding from below as chlorine salts mixed with water and pushed the ice up. NASA's Dawn spacecraft spotted this tall, conical mountain on Ceres from a distance of 1,470 kilometres. The mountain, located in the southern hemisphere, stands 6 kilometres high. Its perimeter is sharply defined, with almost no accumulated debris at the base of the brightly streaked slope. Meanwhile, Debra Buczkowski from Johns Hopkins University in the US and her colleagues conducted a broader analysis of Ceres’ topography and geomorphology. Their report was based on a geomorphic analysis and physical modelling of the images collected by Dawn’s framing camera. Buczkowski and her team discovered that while Ceres is covered with a large number of craters, features such as grooves, pit crater chains and troughs are also scattered around. They argue that many of these features indicate near-surface cryovolcanism. 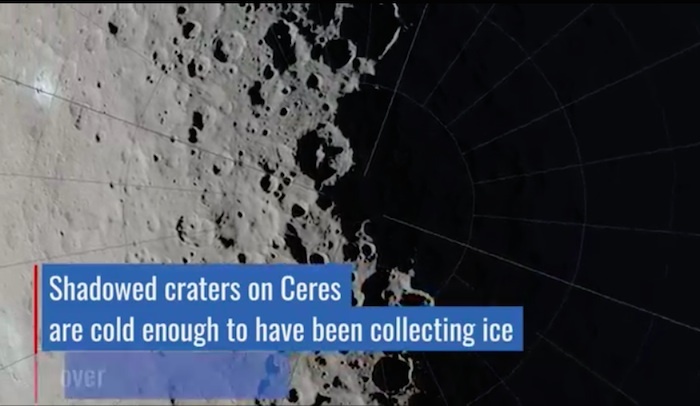 They also claim that although only one instance of surface ice on Ceres has been detected so far, the presence of these other potentially ice-related features suggests that there is ice in other parts of Ceres’ crust. Harald Hiesinger from the University of Münster in Germany and his team found something similar when they looked at more images taken by the same camera on the Dawn spacecraft. According to them, the thermochemical models that had been developed by scientists in the past predicted Ceres should have an icy crust with few or no impact craters. And although Hiesinger and his colleagues’ observations revealed no large craters, the pictures contradicted predictions, as they showed a varied and heavily cratered surface. Some impact craters seemed “relaxed” in shape – evidence the ground there was icy – while others were not – indicating something harder such as rock. They suggest that this, along with the varied features of the dwarf planet’s surface such as polygon-shaped craters, smooth deposits and bright spots suggest that Ceres’ surface is a combination of ice and rock, not one or the other. Christopher Russell from the University of California, Los Angeles in the US and his colleagues looked off the little world to its atmosphere. They peered through the eyes of Dawn’s gamma-ray and neuron detector instrument and mapped charged particles from the sun curving around the dwarf planet. How did this happen? The most likely explanation was that Ceres’ weak atmosphere was ionised – that is, molecules had electrons stripped away – by particles streaming from the sun. This solar wind was deflected around the dwarf planet. Their other explanation was that the salty interior generated an electric current, which created a magnetic field which deflected solar particles – in the same way Earth’s magnetic field does. And this isn’t the last we’ll hear of Dawn. The mission is still active – just today it was moved into a slightly higher orbit to see things from a slightly different angle – and is expected to send back information about the mysterious dwarf planet until 2017 at least. Although there is significant evidence of ice on the surface of the dwarf planet Ceres, the largest object in orbit between Mars and Jupiter, an analysis of the surface geology indicates that ice is not a major factor in forming surface features, according to a paper in the September issue of Science magazine. The paper is based on images obtained by NASA’s Dawn spacecraft, which entered orbit around Ceres in March 2015 after completing its mission on the asteroid Vesta. 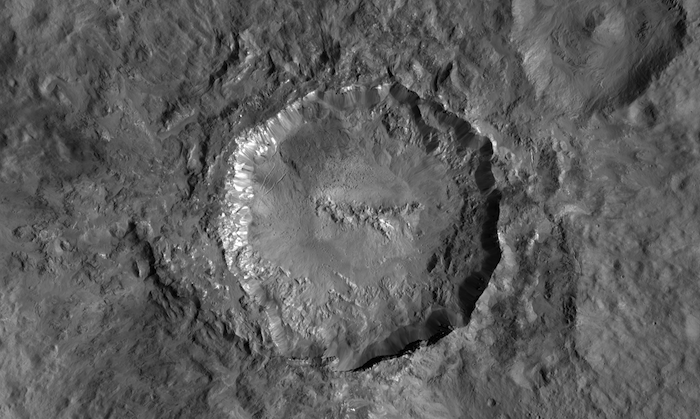 Since that time, Dawn’s instruments have created digital terrain models, three-dimensional visualizations of the surface of Ceres. The resulting mapping allowed for a more detailed observation of Ceres’ topography, which includes impact craters, linear structures, domical features and lobate flows. Craters appear to dominate Ceres, many of which have sharp walls and deep floors, although one topographically high region — a plateau named Hanami Planum — stood out to researchers. 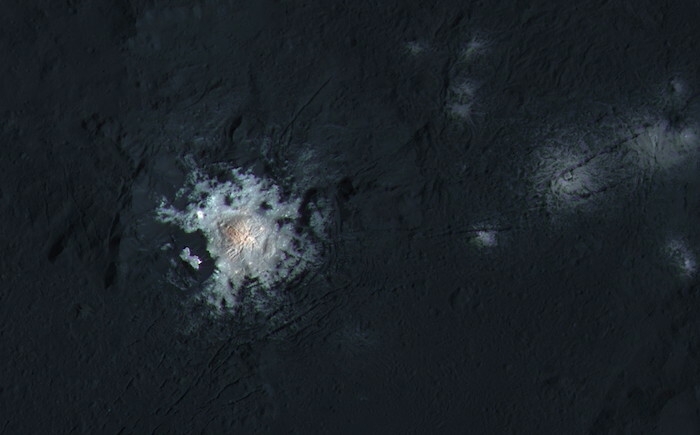 Researchers also spotted multiple mysterious bright spots in Ceres’ craters. 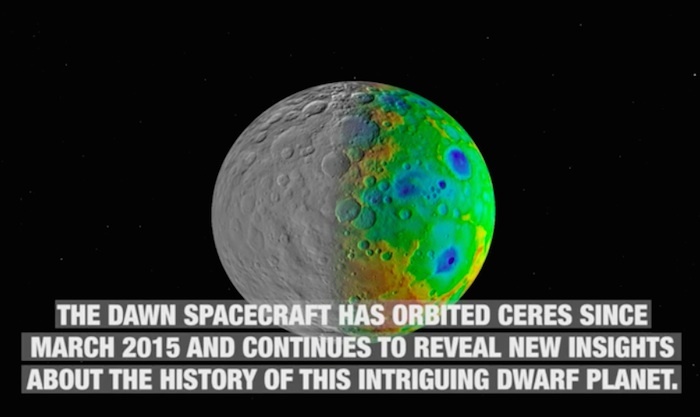 In addition to studying the surface, researchers drew conclusions about the dwarf planet’s interior makeup. Beneath a strong crust composed of rock, ice and salt hydrates lays a water-rich mantle and a silicate core. Evidence of cryomagmatism is found in the floor-fractured craters, while Ahuna Mons and other domical features have been shown to be cryovolcanic in nature. These surface features suggest that Ceres has been geologically active at some point in its past, perhaps even its recent past. 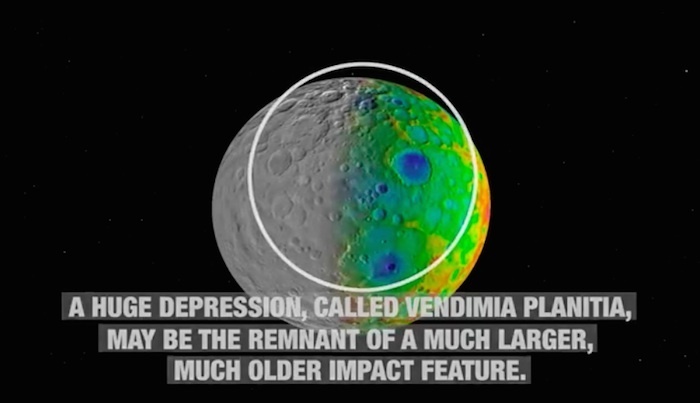 This in-depth study was the first of its kind for Ceres. The primary purpose of the study was to answer questions about the dwarf planet; although some were answered, many more still remain. Buczkowski is also a coauthor of three other papers about the dwarf planet appearing in this month’s issue of Science magazine. Tucson, Ariz. -- Hubble Space Telescope observations of the dwarf planet Ceres have discovered the first evidence of sulfur, sulfur dioxide and graphitized carbon found on an asteroid. The sulfur species are likely associated with regions of recent activity, reports Planetary Science Institute Senior Scientist Amanda Hendrix. The discoveries were made by comparing Ceres’ ultraviolet-visible spectra to laboratory measurements and are presented in the paper “Ceres: Sulfur Deposits and Graphitized Carbon” that appears in the journal Geophysical Research Letters. Planetary Science Institute Senior Scientists Faith Vilas and Jian-Yang Li are co-authors. The new HST observations are complementary to observations being made by instrument on the Dawn spacecraft in orbit at Ceres, covering additional wavelengths. The presence of graphitized carbon is consistent with weathering of carbonaceous material on the asteroid’s surface, caused by processes such as charged particle bombardment. “This is a window to evidence of the effects caused by direct exposure to space for a primitive asteroid surface,” said Vilas. “It is remarkable that Ceres has this graphitized carbon covering much of its surface – which tells us that it’s been exposed to weathering processes for eons – and yet Ceres also shows evidence of relatively young, fresh materials as well,” said Hendrix. “With two space probes planning to rendezvous with dark, carbon-rich asteroids in the next few years, these Ceres observations are helping us to build a good foundation for our understanding of these type of bodies,” Vilas said. Ceres is the largest object in the main asteroid belt, and, along with Pluto, is classified as a dwarf planet.